frequent reference to Canadian citizenship. A historic Lost Canadians court case will begin today at the Federal Court of Canada in Vancouver. Scott's case, advocates say, could become to citizenship what the Roe v. Wade case was to abortion rights in the United States: more than just about one BC woman getting her citizenship card, it calls for a fundamental shift in the way the Canadian government treats citizenship. "This isn't just about Jackie. This is about correcting the law for everybody," said citizenship advocate Don Chapman, who has been at the centre of the Lost Canadians issue for years. "What's this court case really about? It's about equal rights for all Canadians." Scott is the daughter of a British war bride and Canadian soldier who fought in the Second World War. After a lifetime believing herself Canadian, she found out in 2005 that she was not a citizen due to discriminatory laws against children born to unmarried parents, even though her parents later tied the knot and raised her in Ontario. Most recently, officials also told her she could not be a citizen because at the time of her birth in 1945, her father was not yet a "citizen" -- not legally, anyway. According to former Citizenship and Immigration Minister Jason Kenney, every Canadian was a British subject prior to the 1947 Citizenship Act. Scott's case isn't unique. While hundreds of thousands of Canadians got their citizenship in 2009 as a result of Chapman and other advocates' efforts, Scott was among others who remained excluded due to her birth date and the marital status of her parents. Even though Citizenship and Immigration Canada has repeatedly told media that it does not discriminate based on age, gender or marital status, the exclusion of people like Scott bring focus to a troubling point that some Canadians don't have the same rights to citizenship as others. In a dramatic exchange between Scott and Kenney (who was replaced by Conservative MP Chris Alexander during last week's cabinet shuffle), Kenney tells Scott that soldiers like her father may have been heroes, but were "clearly not","obviously not" citizens during the war, since the official "Canadian Citizenship Act" (which extended citizenship to women, the disabled and minors) was only made law in 1947. But, Scott argues, if there was truly no such thing as a Canadian citizen prior to that date, then what did the Canadian government mean by giving its soldiers an educational book in 1943 explaining that they were going to fight the war as "Canadian citizens"? In the book, there are multiple references to "Canadian citizens" and "citizenship" throughout the first chapter. 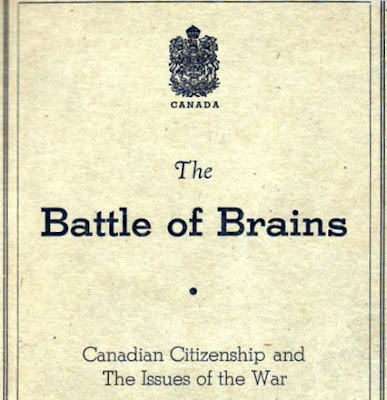 Scott argues that Canadian soldiers like her father considered themselves citizens, and were led to believe this by official government documents. "While Canadian citizenship didn’t exist prior to 1947, it is common usage to refer to people who were living her then as 'citizens', even though in law they would have been considered British subjects....Prior to 1947, there was no legal status of Canadian citizenship of general application as we understand it today." "The simple idea is this: a Canadian citizen is a person in whose name the Government of Canada acts, and whose interests the Government of Canada has undertaken to promote...When did the Government of Canada start acting on behalf of Canadians? Was it in in 1947, or much earlier? The answer, I think, is obvious." "New legislation is anticipated at some point in the future. The details of the legislation will be made known at that time." As to when that might be coming up, Lessange repeated the same response. Kenney had also told Scott that her father wasn't a citizen because everyone in Canada was a deemed a "British subject" prior to 1947. But because "British subjects" weren't phased out in Canada until 1977, Chapman says, you could be both a Canadian citizen and a British subject. What's more, people who weren't part of the British commonwealth in those days -- such as the Chinese -- were never considered British subjects to begin with. All Chinese in Canada, even the Canadian-born, were considered "aliens" and not British subjects. Back then, a handful of wealthy, successful Chinese Canadian could prove their case before a judge and become a naturalized British subject. But even then, exceptions applied: in a 1938 Supreme Court case, a Chinese Canadian woman named Shin Shim was deemed a Canadian citizen, having been at risk of deportation despite being born in Victoria. Eight years later, the citizenship of Japanese Canadians came into question when the courts were trying to deport Canadian-born Japanese "back" to Japan, a country that many had never set foot in before. The Supreme Court ruled at the time that they were, in fact, Canadian citizens. Some in the Chinese Canadian community are currently working with with Chapman to get government citizenship recognition for the Chinese Canadians who died during the Second World War -- such as pilot Quan Louie, after whom a lake in Burnaby is named. After all, if they were neither British subjects nor Canadian citizens, in what country's name did they fight and give up their lives? The Jackie Scott case, advocates say, is about changing existing citizenship law itself. "The one thing that everyone can agree on is that right now, it's a complete mess," Chapman said. Currently, citizenship is based on statute law, not constitutional law: courts have not yet found the Constitution to impose limitations on the way government gives and revokes citizenship. Since the Citizenship Act has been changed numerous times over the years, citizenship in Canada has been arbitrary and changeable in the way it is granted and revoked. Even though government can't deny citizenship to any child of an unmarried Canadian mother in 2013, it can still reject people like Scott on the basis of old laws that at the time of her birth that were heavily discriminatory against women. In the same way that Scott was denied because her parents were unmarried, others have been rejected because they were born in wedlock to a Canadian mother (women at the time could not give citizenship to their children, whereas men could). "No, citizenship isn't and shouldn't be. The Citizenship Act lays out who can become citizens and it is available to anyone ... regardless of marital status or age." Chapman pulls up an article in The National Post, about a federal judge demanding "clearer" citizenship rules. The article quotes the judge urging government to "fix unclear citizenship requirements that kick some applicants out while welcoming others in, depending on which assessment is used." Because of the lack of clarity, it's possible today for an overseas investor to claim citizenship by virtue of spending a minimal 1095 days in Canada over four years, while others can live and work in Canada and decades and have a Canadian parent, and still be rejected. Chapman says there's only one sure way to prove one's citizenship, and it's not as easy as most people think. "That," he said, pulling out his green birth certificate from his wallet, "doesn't prove that you're a citizen. Your passport isn't proof, because Jackie (Scott) had passports too, and that's not proof. Sitting on a jury isn't proof." The laminated citizenship card -- which costs a $75 fee -- is not something many Canadians have in their files. In fact,there are many Canadians today (as many as 250,000, according to Chapman) who may not be able to definitively prove their citizenship if they were challenged by authorities to give evidence. "We need a new Citizenship Act," he said. "One of the things that happened when the Charter of Rights and Freedoms came into play is government agencies were given three years to bring all their policies to charter compliance. There's only one law they didn't do that with -- citizenship. If they'd just done their job in 1985, we wouldn't be here."